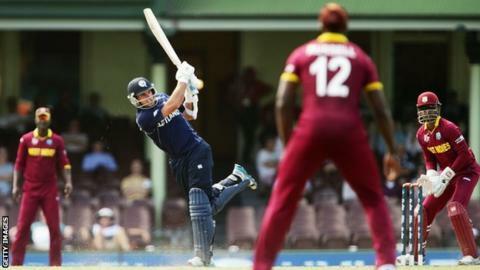 Scotland's cricketers lost their final World Cup warm-up match against the West Indies by three runs in Sydney. The Scots were set a victory target of 314 after the West Indies reached 313 for nine off their 50 overs, Denesh Ramdin making 88 runs. In reply Scotland made 310 for nine, with vice-captain Kyle Coetzer top scoring with 96 and Richie Berrington making 66. But Majid Haq and Rob Taylor were both out for ducks as Scotland fell short. An otherwise composed chase by the Scots began to fray after Berrington was run out by Andre Russell, leaving Scotland on 302-7. The Scots, who beat Ireland by 179 runs in their previous warm-up match, lost four wickets for seven runs at the end. Grant Bradburn's Scotland team start their World Cup campaign against New Zealand in Dunedin on Tuesday, with matches against England, Afghanistan, Bangladesh, Sri Lanka and Australia to follow.